I am regurgitating a post (almost) from all join in blog as I was thinking of this, this am when the toddlers had sheep/ shepherd play materials out and thought it would be good to follow this up with some play dough another week. 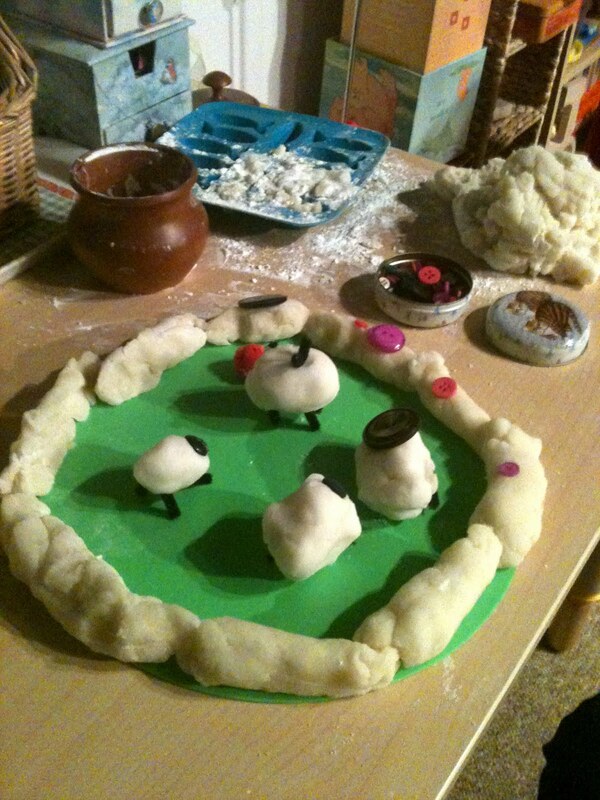 The sheep play dough has previously been well received. The play dough was made white to create sheep (although black could be made also, but I never have huge success creating non greyish play dough). The whitest playdough contained only cornflour (cornstarch), using recipe 1 from the Gluten free playdough . The whitish playdough was made using a traditional playdough recipe but substituting plain flour for half self raising and half cornflour. The dough was supplemented with short lengths of pipe cleaner (legs), buttons, (eyes, although also used as flowers in the photo above) if I was to do again i'd probably use large goggly eyes too) and rubber mats for fields (and water). The supplementary materials were simply there, and children were not told what to do with the pieces other than shall we make some sheep for the shepherd. We offer superb quality Rubber matting that is produced from pure and finest quality rubber mats.The Rubber matting uk offered by our organization is genuinely the solution against the slipping over the ground. We are truly the industry leaders. You can vise my Site:Rubbermatting-uk.uk/Best Of Luck.